I suppose my fascination with backpacking and thru-hiking started in the ’80s, when as a Boy Scout I first heard about the Appalachian Trail. The enormity of it, and the idea of seeing far-off exotic places like Georgia, were (to this kid from Nowhere, R.I.) compelling. Fed on a steady diet of fantasy novels like the Lord of the Rings (pre-movie), the idea of a long, epic quest was always appealing. In 1997 I folded up my IT consulting business. I put my stuff in my Dad’s attic, bought a giant Dana Astralplane backpack, got a ride to Baxter State Park in Maine, and started walking south. I’ll post my gear list later, but at the time my big four (pack, tent, bag, and pad) weighed 18 pounds. At the start of the 100-Mile Wilderness it was close to 70 pounds total, including things like canned pineapple, a few cucumbers, and a cotton sweatshirt. Hey, it was the ’90s. To keep a positive attitude, I named myself “All Downhill From Here,” since Mt. Katahdin in Maine is taller than Springer Mountain in Georgia. I think the math comes out that a straight line connecting the peaks drops 3/4 of an inch for every mile south you travel. A lifetime spent in sneakers had not prepared me terribly well, and the heavy pack and rough terrain, combined with a poor choice of boots, did me in by Hanover, N.H. Crippling plantar fasciitis; my quest was over. In 1999 I did much the same. On this attempt I decided to enjoy the process itself a little more. I took the 24-hour bus ride to Georgia. Pro tip: never, ever take a 24-hour bus ride. It started off as a sort of hip pastiche of On The Road and Simon and Garfunkel’s America, and turned into something far more tedious and uncomfortable. Coming north, all along the trail, there were whispers of this OTHER trail – a longer trail, a higher trail, a more badass trail, called the PCT. Many of us vowed to try it. Reaching the Vermont-New Hampshire border, in the tiny town of West Hartford, I stopped, stunned. I had finished the Appalachian Trail. It took me nearly an hour to process. I hiked New Hampshire as a victory lap with my trail family since I was still in trail shape, and unemployed. Another pro tip: when you’re in awesome hiking shape, take advantage of it to cruise over monster New England peaks. I’m not sure what exactly sent me home at that point. I think it was the familiarity with the trail, mountains, shelters and towns; something awesome had been lost. I had just been on Katahdin, it seemed. In college I climbed a few of the Adirondack mountains, and learned that there were exactly 46 High Peaks. If you climbed them all, you became known as a “46er“. A list of mountains and an accompanying map is a great way to plan three-day weekends, so over the years I tackled them all, eventually finishing up in 2015. Because I could, I also did the Saranac Six, another set of mountains in upstate New York. The tiny state of Rhode Island has its own long distance trail – the North South Trail. 78-point something miles will take you from the ocean to the Rhode Island-Massachusetts border. A few years back, I did it in just over three days. Life happens. Fast forward to 2017; I finally put the pieces in place to try to walk the PCT. The beard wasn’t quite as long as in 1999 when I was voted “phattest beard on the trail,” but it had became a lot grayer, hence the nickname. Money had been saved, jobs left, domain names parked, wood split and stacked. 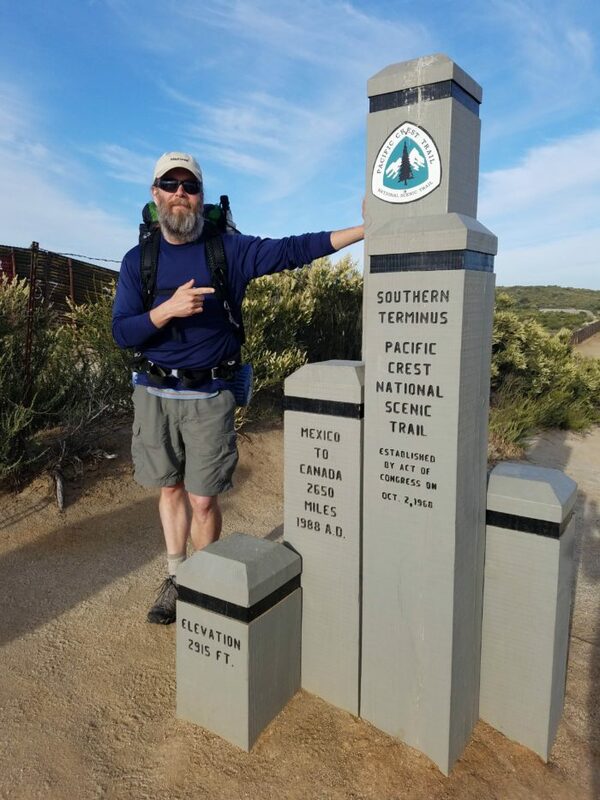 I headed for San Diego on May 11, and got on trail on the 14th. On the trail I had an amazing time, met and hiked with interesting people, and saw some beautiful, alien things. 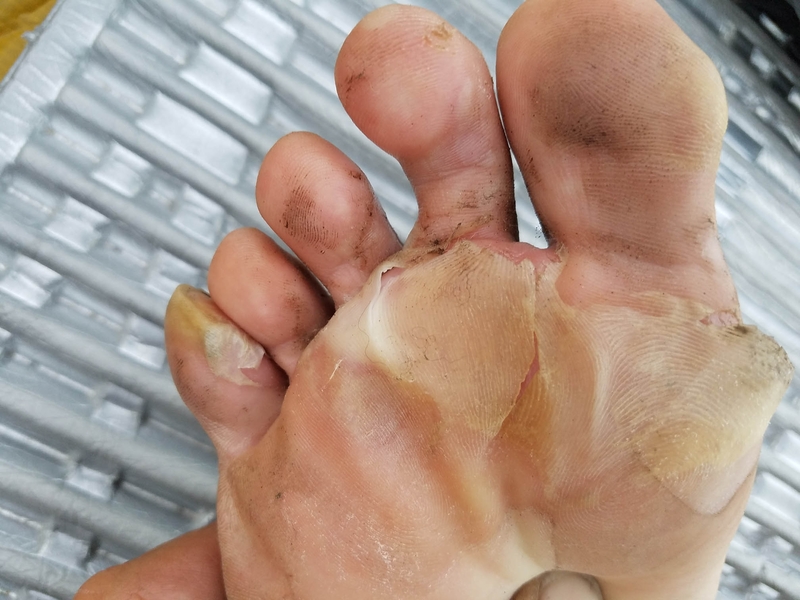 I had trail-wide epic blisters; people would, upon learning my name, ask to see my feet, which they had only heard rumor of or seen on Instagram. Part of the problem was that a foxtail became embedded in the pad of my right foot. With each step I drove it deeper. Eventually, I ended up cutting it out myself. Around mile 300 in Deep Creek Canyon, I knew there was something fundamentally wrong with one of my feet. A bottle of Aleve and 69 miles later I washed up in Wrightwood, Calif. After a week’s rest with no improvement (and a sinking sensation that it was, in fact, broken), it was confirmed by X-ray. 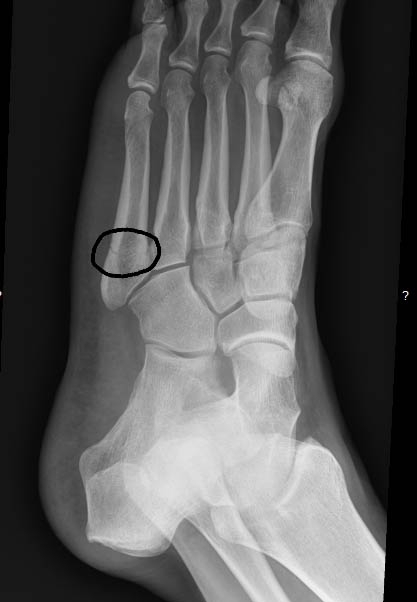 A Jones fracture – hard to heal, six to eight weeks minimum, completely off the foot. Game over, man. I headed home. Here I am. This time it’s for the win. Similar story here– 1st AT attempt in ’96 wasn’t what it could’ve been (lack of focus, yellow blazing); went back and did it all over the right way during the winter of ’01-’02. PCT awaits… one day. Meanwhile, lots of trails to walk here in Japan. Happy trails! Thanks! Gotta make it happen, otherwise one day becomes never. Any long distance trails over there? I think an end-to-end of Japan would be cool! Yeah, lots of trails of all lengths in Japan. The Shinetsu and Takashima trails are both less than 100km. The Tokkaido trail between Tokyo and Kyoto is around 500km. The Shikoku 88 Temple Pilgrimage is a 1,200km loop. The Kyushu Nature Trail is a 2,500km loop. You can get out and stretch your legs a bit. Btw, how can I keep up with your hike? This website doesn’t really say. On my author page there’s a follow option – however, I notice it’s not visible using Internet Explorer for some reason, so it might depend on your browser (Chrome, Safari, etc). Can you try another browser? I’ll also be cross-posting to my personal blog at https://smokebeard.wordpress.com, and you can follow me on Instagram at @edthesmokebeard.